It’s mid-April so I thought I was done with my slow cooker and slow braising for the year. However, the weather here made me think otherwise. Last Sunday was ridiculously cold and windy! Winter was having it’s last hurrah so I took the opportunity to make one of my all-time favorite things in life… Beef short ribs! Beef short ribs may look hunky and clunky, however, with a little time they are transformed into something buttery and meltingly tender. 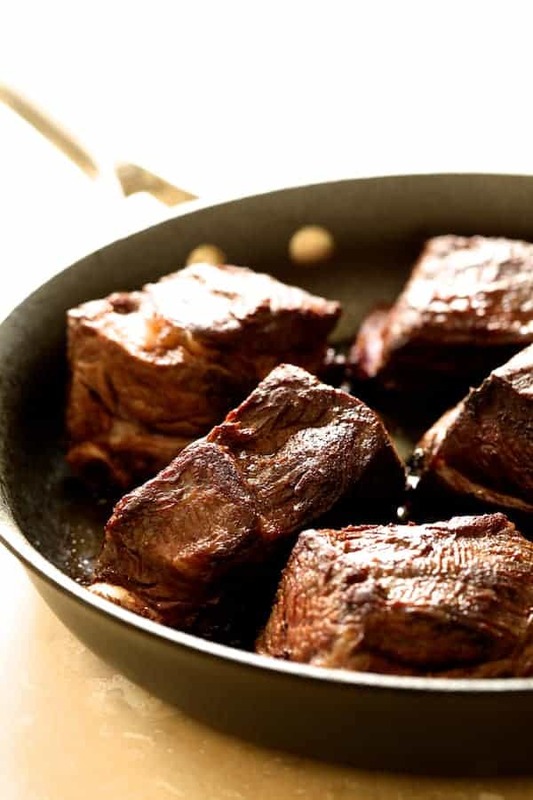 Here’s more information on short ribs: What are Short Ribs? 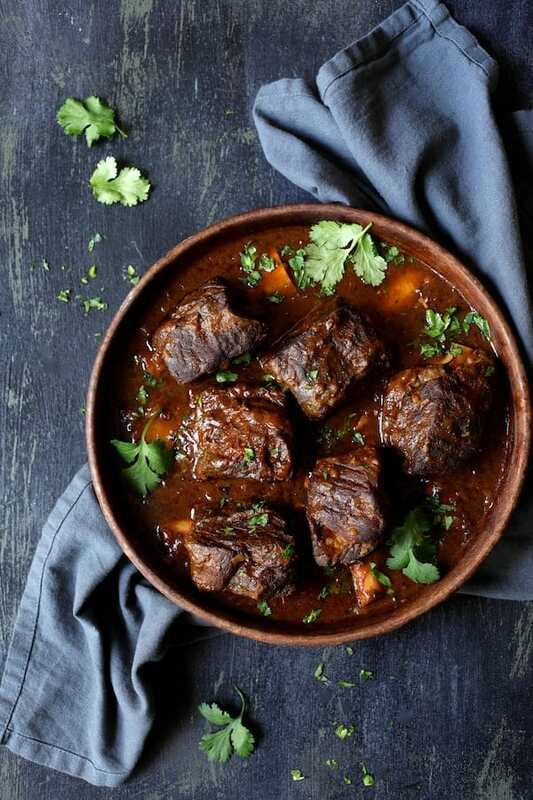 A slow braise is the perfect way to transform them and it’s one of my favorite cooking methods whether it’s in a slow cooker or in the oven. I know what you’re thinking. You’re wondering why I wouldn’t just use an Instant Pot or electric pressure cooker so they’re done in 30 minutes? 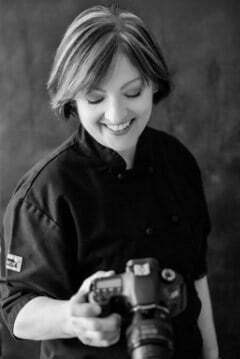 I know all about Instant Pots and electric pressure cookers because I use them frequently in my personal chef business. I also have not felt moved to jump on the Instant Pot bandwagon because everyone else has. 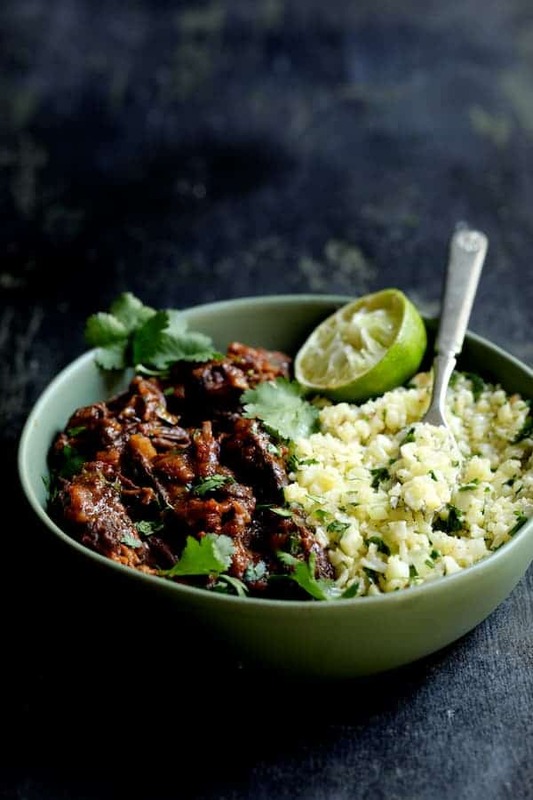 Use an electric pressure cooker for these Slow Cooker Beef Short Ribs Barbacoa if you’d like. However, I think meat done in a pressure cooker tastes “forced.” Flavor is developed over time and the connective tissue in cuts like beef short ribs needs time to break down. 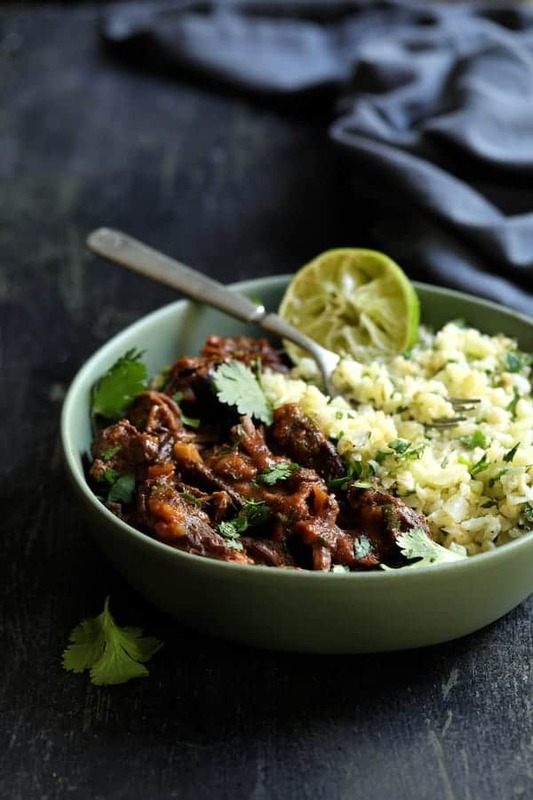 Just look at these beauties from the slow-cooker! For a dish such as this, I like to preheat my slow cooker. I get all the liquid ingredients, herbs and spices in the slow cooker, then turn it to the temperature I’ll be cooking the dish at while I’m browning the ribs. When you’re ready to place the lid on the slow cooker, then reset the timer to four or eight hours if using one that’s digital. Mwwaaaahhh! 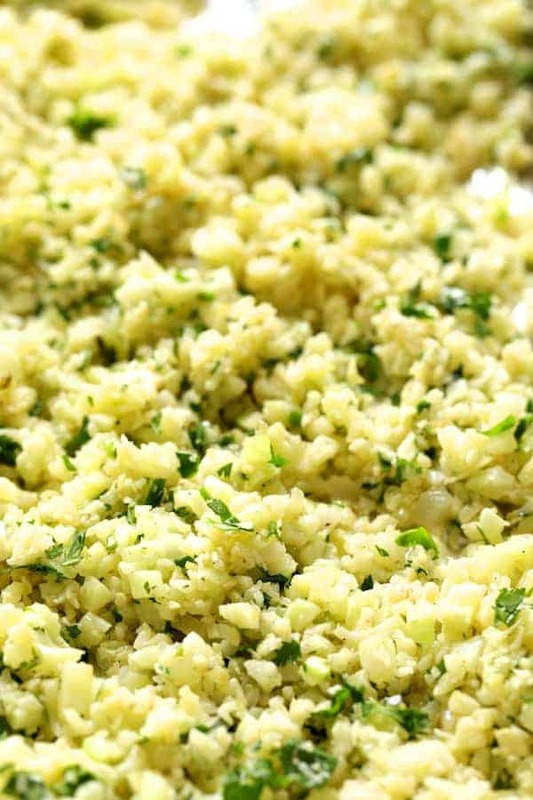 Serve them whole with the Cilantro Lime Cauliflower Rice or…. …remove it from the bones and shred the meat. I don’t do cauliflower rice on the stovetop anymore because it’s difficult to cook evenly and then it overcooks quickly. Roasting it in the oven is the perfect way! Place the cauliflower in the oven when the beef short ribs are finished. Slow Cooker Beef Short Ribs Barbacoa are perfect for tacos, too! 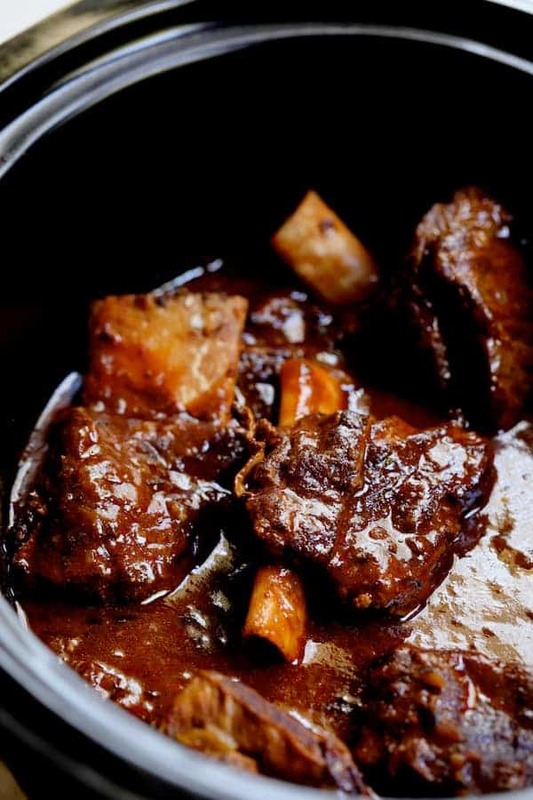 SHORT RIBS: Combine first 9 ingredients in a slow cooker. Set slow cooker on High (4 hours) or Low (8 hours), depending upon your preferred cooking time to preheat. Heat oil in a large skillet or saute pan over medium-high heat. Season short ribs generously with salt and black pepper. Brown well on all sides. Place in slow cooker. Place onion in the skillet. Reduce heat to medium and cook the onion for 3 to 4 minutes to soften and get the browned bits off the pan. Add the garlic and cook 30 seconds or just until fragrant. Transfer to slow cooker. Cover and cook 4 hours on High or 8 hours on Low. CAULIFLOWER RICE: Preheat oven to 375 degrees. 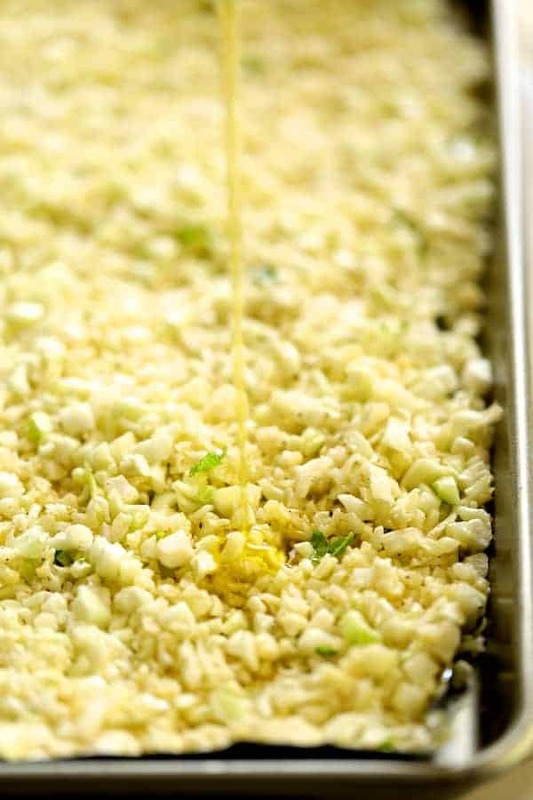 Place cauliflower on a large baking sheet. Stir in garlic. Drizzle with olive oil and lime juice. Season to taste with salt and black pepper. Roast for 10 to 12 minutes or to desired doneness. Stir in cilantro. Made this tonight and followed the recipe. It was a hit! Only change was I had 4 pounds of boneless short ribs. Worked great with the original quantities listed. Fed 4 of us, and enough left over to shred for enchiladas!!! Thanks! Hi, David, Thanks so much and so glad you enjoyed! 6 long cut short ribs should be about 4 pounds so you’re right about the amount. I love having leftovers, too! Especially ones that can be “repurposed.” Sounds like a delicious idea! Thanks again and please stay in touch! 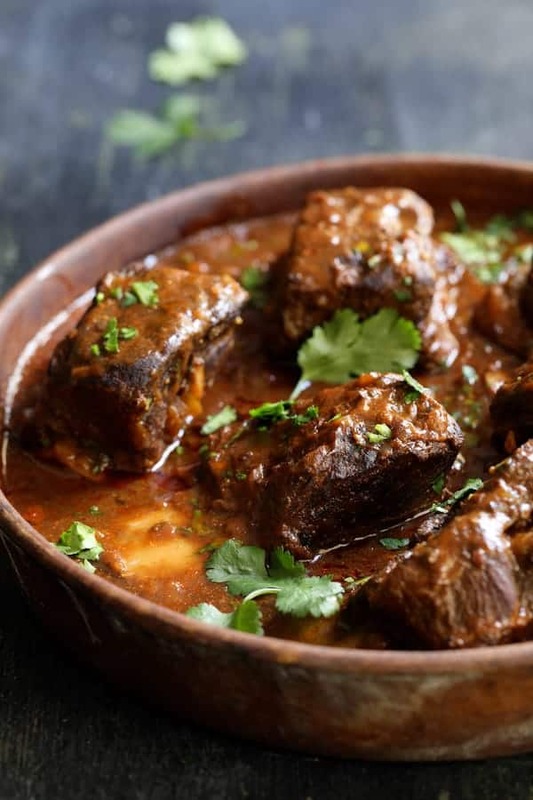 I have been scouring the interwebs for a slow cooker spicy short rib recipe. I’m making these and putting the meat in enchiladas! Can’t wait!! Thanks so much, Karen! The meat is perfect in tacos and enchiladas! Hope you enjoy! Can’t wait to try this for the family. Sounds delicious! Thanks, Chris! If it’s too spicy for kids, just cut back on the chipotle. Hope you enjoy!